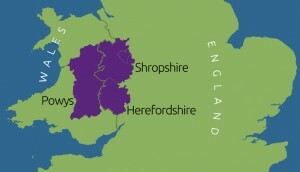 The wandering border that divides Wales from England is still referred to as the Welsh Marches. In southern Shropshire lies what some refer to as the capital of the Marches, the medieval town of Ludlow, home to the arts, good food and history. Dominant features of the town are the tower of the parish church of St Laurence and Ludlow Castle which was first begun only 20 years on from 1066 and all that. The castle is currently owned by the Earl of Powis and the trustees of the Powis Estate. Unlike the intact Powis Castle near Welshpool, Ludlow is a ruin but welcomes visitors to clamber about the battlements and hosts a variety of festivals through the year. South of Shropshire is the County of Herefordshire, its county town being the medieval city of Hereford whose cathedral is home to the longest surviving Chained Library in the world and the extraordinary Mappa Mundi, the largest known medieval map in existence. Mostly made from local sandstone the reddish colour of the cathedral gives it a great feeling of warmth and security. These three counties of England and Wales are amongst the least populated of the UK. All three have sheep and cattle named after them, most notably Hereford cattle, the most famous and widespread breed in the World. Hereford is also home to cider apples and cider making companies. The city of Hereford houses a Cider making museum. From Shropshire, locally produced blue cheese and bread can be enjoyed with magnificent views from the high points of Clee Hill, Wenlock Edge, the Wrekin, Long Mynd and the Stiperstones, the latter supporting tales about the Devil’s Chair which overlooks Powys to the west. So why do we love the area so much, and why do we want to share it with you? In short, it’s beautiful, it’s calming, it re-energises. It speaks out to the historian inside, the engineer (when you consider the decision to take water to Birmingham, Liverpool and Swansea), the artist, the explorer, the photographer. A few short years ago the BBC reported that Powys is the happiest place in the UK so being right next door must surely make Shropshire and Herefordshire pretty happy places too! This is what we mean by civilisation.